You're dealt a pair of nines, while the dealer draws an upcard of 7. It's a multiple deck game with DDAS (Doubling-down after a split) available, and your choice here is to either stand on the hand or split it up. 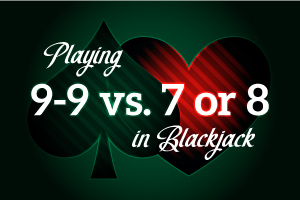 The nines would be split against the dealer's six, and also the eight, as we'll see in a moment. Is it the same case here? Even though you can split and have a pretty strong starting point on two separate hands against the dealer's weakest "pat" upcard, you're going to stand with this hand. When you come to think of it, on the surface, this play makes sense, since with a hard 18 there's a strong possibility you can beat any hand that can be made out of dealer upcard of 7. In fact, you'll beat it 63% of the time. If you split the nines, you will only win approximately 53% of the hands. This is one of those situations where it doesn't make mathematical sense to get greedy. This represents a gain, so expect to win with the 18, and take no less than a push. Now let's look at that same pair of nines, where the dealer gives himself an eight as the upcard. Here you're pretty much staring a push right in the face. In fact, the dealer will have an eighteen 36.5% of the time. You will lose over 25% of the time if you stand, and win the rest (approximately 38.5%). Standing with a hard 18 against the dealer eight is not the worst situation in the world. But perhaps we can do better. If you have an opportunity to improve your lot, you should do so. You'll win 49% of your opportunities there while losing less than 40%.